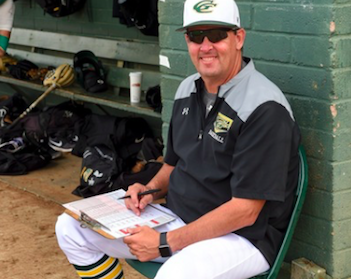 EL CAJON – Grossmont College head baseball coach RANDY ABSHIER has been pulling double duties these days. The Griffins, without a pitching coach in 2017, have called upon the skipper to add pitching coach to his responsibilities in leading the program. 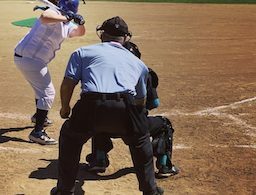 The short-handed approach hasn’t hurt, obviously, after Grossmont (10-0 PCAC, 15-5-1) rolled to its 10th-straight win and 13th-straight game without a defeat, clubbing Mt. San Jacinto, 8-1, Tuesday afternoon. JUSTIN BURKEY doubled in the Griffins’ four-run fourth, then hit a three-run home run in the fifth to break the game wide open. Burkey is hitting .372 this season with 18 RBI in 20 appearances. Leadoff man DAVID MALDONADO knocked in another pair of runs with two hits. Maldonado has 27 RBI and nine stolen bases this season. Catcher TREVOR BEARD, who certainly can share some of the staff’s success with his artful signal-calling, had a pair of hits and drove in a run, but more importantly, helped TIM HOLDGRAFER to another stellar effort. Holdgrafer improved to 4-0 with seven innings of three-hit ball, striking out four and walking one. Holdgrafer has a 2.45 ERA this season. Grossmont remained atop the Pacific Coast Athletic Conference by 1 1/2 games, but second-place Mesa is 7-0, while third-place Palomar is 9-1. The Griffins meet Mt. 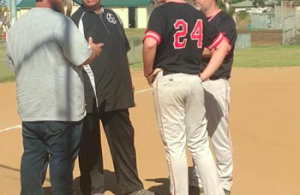 San Jacinto, which is winless in the PCAC and has just three wins on the season, again on Thursday (weatehr permitting) on the road at 2 p.m. and Saturday at home at noon to complete the three-game series this week. N. Strohl homered to left center, RBI. J. Burkey doubled to left center, RBI; N. Navarro scored. T. Beard singled, advanced to second on a fielding error by cf, RBI; M. Diffley advanced to third; J. Burkey scored. D. Maldonado doubled down the lf line, 2 RBI; T. Beard scored; M. Diffley scored. J. Burkey homered to left center, 3 RBI; N. Navarro scored; R. Bostedt scored. 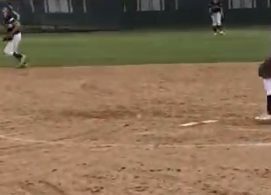 S. Ybarra grounded out to 2b, RBI; M. Alonzo advanced to third; N. Brock scored.